Sudoku puzzles appear in dedicated puzzle books or in your daily newspaper. When playing sudoku, you don't need to use arithmetic skills even though the game consists of numbers one through nine. Children and adults can play sudoku, since these games range from very easy to incredibly challenging. 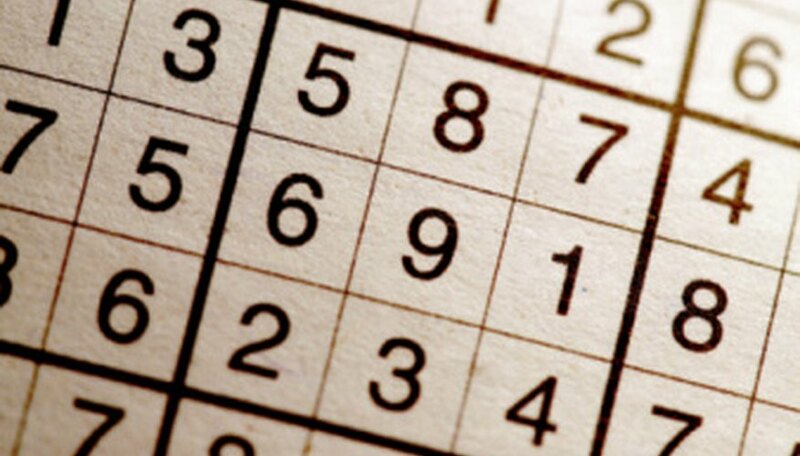 Sudoku requires using your mind and power of deduction skills to determine where each number in the diagram fits. Look at the size of your diagram. Each row, column and square on your diagram must have each number once but no more. For example, in a diagram measuring 9 by 9, each row, column and square must have the digits 1 through 9 once without duplication of any number. Analyze the location of squares that already are filled in. If a box has a 5 and 9, you know that the box needs the seven other digits to be complete. Look at the diagram in terms of three sections, the top, middle and bottom boxes in rows. Use a pencil to fill in possible numbers so you can erase them if you're wrong. It's easier to write "5 or 6" in a box than to remember that the number in that box needs to be one or the other. Use a pen to finalize your answer if you know a number is correct. Continue filling in boxes until each row, column and box has all digits once and only once. Check your work along the way to verify you don't have duplicated numbers. The larger a puzzle is, the more difficult it will be to solve. Try learning online using an online Sudoku player where you can check your work frequently to ensure you're on the right track.